Bake delightful popovers with crusty outsides and fluffy insides. 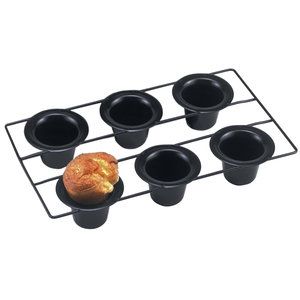 Pan makes 6 round popovers. Hole size: Top: 3"/7.5cm - Bottom: 2"/5cm - Depth: 2.5"/6cm. Recipes and instructions included. Hand washing recommended.